Jesse: "What are you making?" Me: "Um... I don't really know... Mexican balls?" 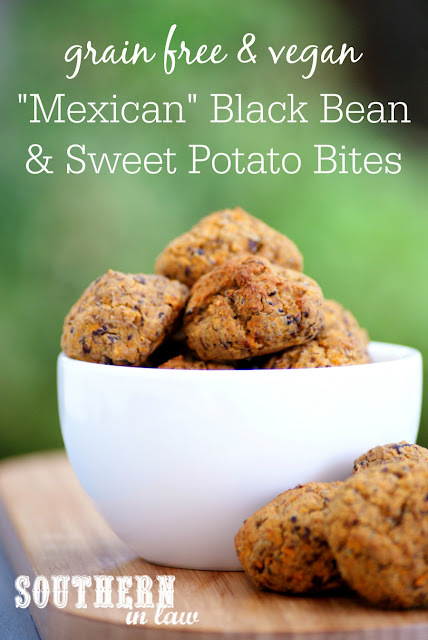 Jesse: "Please don't call them that on the blog"
Me: "Okay, Mexican Falafel... but with black beans... and sweet potato... and different spices"
Jesse: "So they're not falafel at all?" Me: "Erm... no... but they're ball shaped?" Jesse: "Please stop saying balls..... What are you going to call them?" 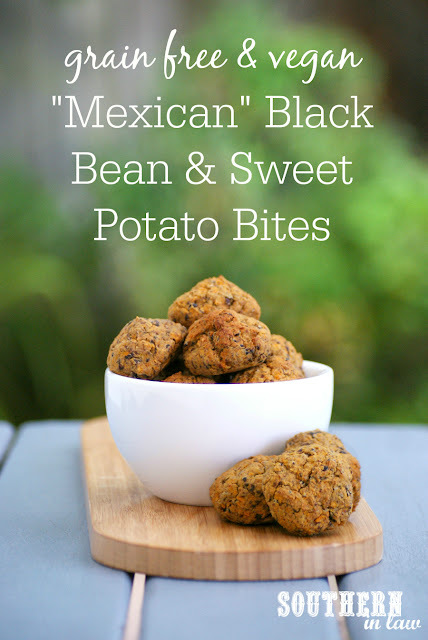 Me: "Um... Mexican Black Bean and Sweet Potato Bites?" Jesse: "I guess that'll do"
This is the conversation that happened in our house the first time I made these bites. You see, I decided I had to have some kind of baked plant based addition to Super Salad Sunday - only I didn't feel like my Healthy Baked Falafel Recipe because I'd just eaten two batches during the week. Just like most of my recipes, I started throwing things into the food processor and hoping it would come together. Digging through the cupboard I found black beans. "Hm, Mexican", I thought. Then I spied a bag of sweet potatoes. "They'll do", I thought. Blitzing them in the food processor and adding Mexican inspired spices I decided they needed something to bind them. I opened up the pantry and a bag of chickpea flour fell out. Bingo! But whatever you want to call them, I promise you these bites are seriously delicious. We've been eating them on top of salads, dipped into guacamole (you NEED to try these with avocado.. they're made for it), eaten on their own, heated up and used in a wrap... you name it, we've tried it. Preheat your oven to 180C/355. In a food processor, grind up your flaxseeds and set aside. Add your sweet potato to your food processor and process until chopped. Add your black beans, flaxseeds, cumin, onion powder, oregano and salt and process until combined. Add in your chickpea flour and pulse until incorporated. If needed, add a few extra tbsp of chickpea flour if your mix is too wet. Scoop heaped tablespoons of your mix onto your prepared tray. 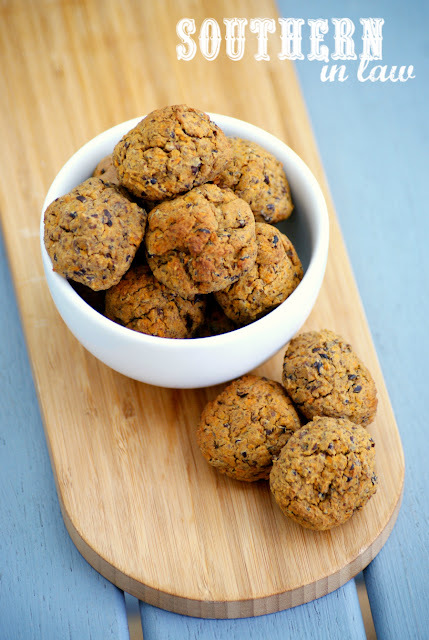 Use a rounded tablespoon measure if you don't want to roll them with your hands or slightly wet your hands and form the mixture into a ball before placing them onto your tray. Bake your bites for 15-20 minutes or until golden and crunchy on the outside. Allow to cool slightly before serving. 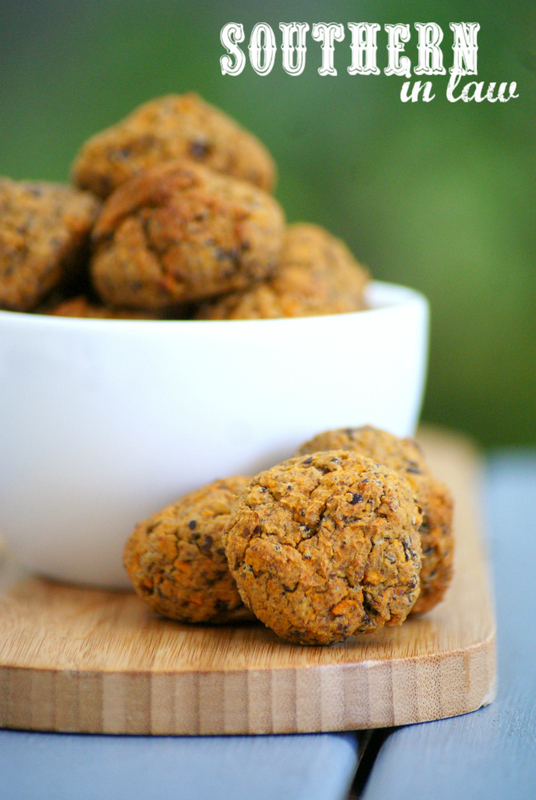 We like to eat these bites on top of salad or dipped into guacamole, however, you can serve them however you like! These bites will keep in the fridge in an airtight container for up to a week and can be frozen to defrost and reheat later. But tell me, what's your favourite cuisine? Mexican? Italian? Indian? American? Thai?